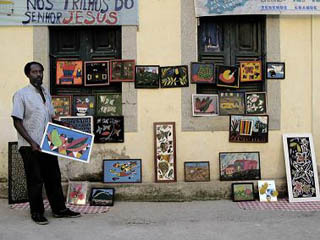 Santa Teresa artist. Photo by Andreas Lönngren. To begin with I want to make clear that with “Art in Rio” (this section) I have no other ambition than to explain where you can find the most sought after motifes and objects. Since they are related to where you can find souvenirs, jewelry and hammocks I also included them in this section. This is not about fine arts. The favela houses on the hill and the black women in their big skirts (baianas) are by far the most popular art motifes. 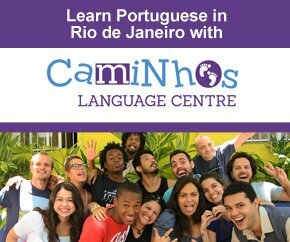 Good places to find them is on a Favela Tour or in the Night Market in Copacabana. The latter is open Mon-Sat from 18h, location is between Posto 5 and 6 map, the collection here is pretty small though. 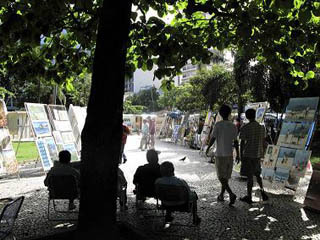 Then it’s much better at The Sunday Market in Ipanema (Hippie Fair) on the square General Osório map. Open from 11h on Sundays. The whole middle part of the fair is dedicated to art. From my own perspective I don’t think that the standard is that high but there are some of the stuff that is pretty decent. If you are looking for more serious art in Rio you should go gallery hopping in the neighbourhood Santa Teresa. Art dealers at the Hippie Fair. Photo by Andreas Lönngren. In Rio you have lots of jewelry stores, due to Brazil’s richness in precious metals and stones it is a pretty big trade. There is really no reason to go to the big firms like Amsterdam Sauer or H Stern other than to look around, the jewelry is exclusive and prices high. 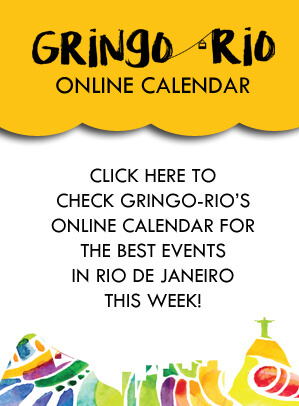 If you are looking for more conventional objects you have several stores along Visconde de Pirajá in Ipanema, Av. N. S. de Copacabana in Copacabana and in the Saara district in Centro; more on that is written in the Shopping in Centro section. When it comes to more fun and innovative stuff the hippies on the beach always offer a nice selection. In the above mentioned Night Market in Copacabana and the Sunday Hippie Market in Ipanema you can also find a lot of the cheap home made stuff.